Core Data has an opening for three (3) experienced senior-level C++ programmers to add to our existing team. This work-from-home contract style position offers a full time opportunity to each developer selected for the position. This advertisement is intended for senior-level applicants with demonstrable experience in a professional work environment. While experience with systems integration and complex APIs will receive priority over developers that do not have this type of previous experience. Applicants will be expected to have the requisite knowledge and experience needed to create professional-quality, bug-free production quality applications. The range of projects is split between two separate product lines currently maintained by the company. The first collection of projects relates to a sports wagering software that produces statistics, betting odds, and supporting structures. The second and newest collection of projects relates to the banking and finance realms. Examples include integration with exchanges, integration with cryptocurrency wallets and APIs, development of buy/sell algorithms, and creation of various web services to facilitate online banking. Many of the projects we take on are of advanced level and require analysis and planning on an individual basis in addition to code writing. For this position, emphasis is placed on the applicant's ability to produce solutions with minimal outside help. As this is a senior-level position, all applicants are expected to be able to write the required applications from start to finish, including design of any database queries or tables. Design specifications will be provided for each project prior to commencement. While actual programming ability is one of the key requirements of this position, applicants for this senior-level posting are expected to show initiative and take a practical approach towards solving real-world problems. The projects are challenging and quite exciting, and even the most experienced of candidates are certain to learn new skills and techniques while working with our company. Ability to design tables, indexes, and SQL queries to support the data layer of applications. Specific experience with MySQL preferred. First and foremost, we are a software development company owned and operated entirely by professionals with a strong technical background. Since technology is our core focus and software is our principal product, all projects at CDS are important and recognized by the highest levels of management. We believe in hiring the best candidates for every position. It is for this reason that we do not restrict ourselves to arbitrary geographical locations. Most of our staff works on a remote basis. Our hiring decisions are based on one's abilities, not location. The projects we take on run the gamut. Primarily we are a data and statistics provider with an emphasis on low-latency, real-time data feeds. 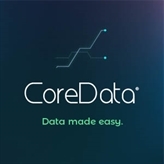 Want to get notified about new jobs at Core Data?